Shoreline Parasailing is southern BC’s only company offering this experience high above Harrison Lake. No experience required as you are gently lifted off the back deck from our custom 28-foot Parasailing boat. 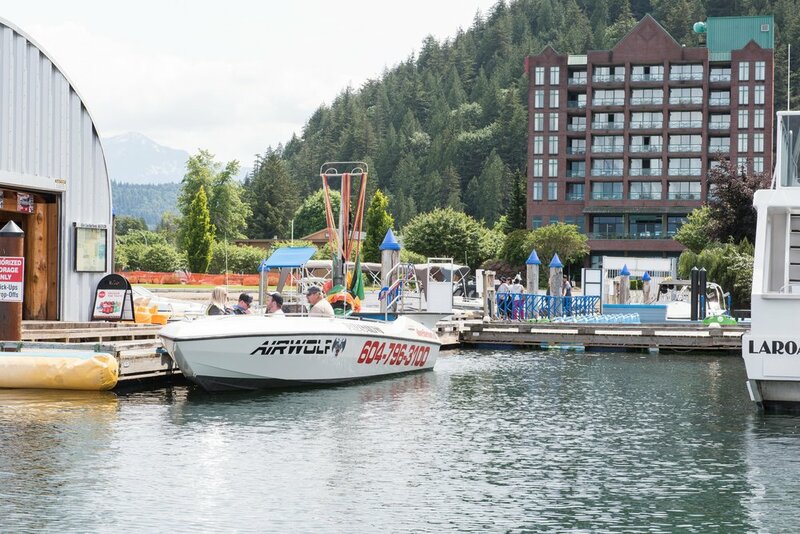 Sit back, relax and absorb the amazing views from 400 feet above the beautiful Harrison Lake. The boat can hold 10 passengers, and each trip lasts approximately 30mins. Flights up to 12mins depending on weather and season. Our experienced and highly trained Captains and crew, will ensure you are comfortable and safe throughout your time with Shoreline Parasailing. We offer single, tandem and triple flights. No physical restrictions. Online bookings are encouraged as slots fill up fast! Take your pictures home on SD Card!! No, absolutely not. Parasailing is very serene and peaceful. You’ll take off and land slowly, so you don’t have to worry about a scary experience. And when you’re the air, all you’ll be thinking about is the spectacular scenery. Yes – as long as it’s done in the right conditions, parasailing is very safe. We take every precaution possible to ensure your safety, including inspecting the tow line, winch system, harnesses and flying equipment daily. We never fly if it’s too windy or in rough sea conditions. If Mother Nature is not cooperating, we don’t hesitate to reschedule or refund your flight. We follow these procedures because your SAFETY is our number one priority. Would you recommend making a reservation? Yes! Because of limited seating and our growing popularity, we highly recommend making an online reservation before you arrive. We always encourage people to book early because weather is sometimes a factor and you wouldn’t want to miss out. The boat cruises the in bay of the Harrison Lake, occasionally cruising North-West of Echo Island in search of calmer skies. You will always be within sight of the beach located in Harrison Hot Springs. Towards the end of the flight, if conditions allow and you are interested, the captain can dip your feet in the water briefly before you gently land back on the platform of the boat. 4 years old and up can fly. Any age can ride on the boat. As long as you can properly fit in our approved life jackets and our inspected harness, you can fly. Remember, small children need to fly with a sibling or a parent. We accept cash, debit cards, Visa, MasterCard, and American Express. All USD will be accepted at par to CAD. Am I guaranteed to fly with my friend or partner as a tandem or triple? Usually, but each flight is dependent on weight load and wind/weather conditions. We’ll do our best to ensure you fly with your friends and family, but it’s ultimately at the Captain’s discretion how, when and where it’s safe for everyone to fly. How long am I in the air? Can anyone go on the boat to watch as an observer? We can mark you down as an observer when you book, and there is a fee. We recommend wearing shorts and a t-shirt over bathing clothes, and flip flops or sandals for your feet. In cooler conditions, it’s recommended to wear a long-sleeve shirt, hoodie or jacket, and even in summer an extra layer is nice to have, especially after a dip! Don’t forget sunscreen! Sunglasses, hat, sunscreen (please apply before boarding the parasail boat) and a small towel are recommended. For hot days, drinking water is also nice to have since the boat ride is about 30mins. Please apply sunscreen prior to boarding the boat. If the Captain wouldn’t fly his own mother, he won’t fly you either, as safety is our number one concern! If there is inclement weather anywhere nearby, we’ll bring you back to land. Based on our weather radar, we may either go on stand-by or close down completely, the same applies for high winds. If you book and were not able to fly with us, you may choose to be refunded or rescheduled. We don’t push the limits. Again, your safety is always our number one priority. Can I buy pictures of my flight? Yes, you can. We offer photo and video packages. We supply the camera and you get to take away the SD Card with your photos and video. We are open 7 days a week, weather permitting, from June 1, 2018 – September 15, 2019. Flights start at 8:00am. We have a 28-foot Nordic Ascender. These beautiful boats seat 10 passengers and are second to none in the parasail industry. They are specifically designed for the purpose of parasailing. The vessel is Transport Canada approved and certified, this includes the vessels hull, engine and safety gear. Captain and crew are both certified in First Aid and CPR and practice safety drills regularly.